Now that my best friend has received it, I can finally post pictures of my completed Bottled Rainbows quilt! When I started this quilt it was for me and for fun (many thanks to Rachel for the QAL!). I already had another quilt in mind to make my friend as her wedding gift, but as time went on, I didn't feel my original idea was special enough. Then it hit me! Duh! I should make the Bottled Rainbows for her! This is such a special quilt with so many special fabrics (not that she understands, but, whatever, I know they're special). One block has special meaning for her (the pink one). When my friend was getting back into the dating world after her divorce, she would journal about her dates and compare them to shoes. 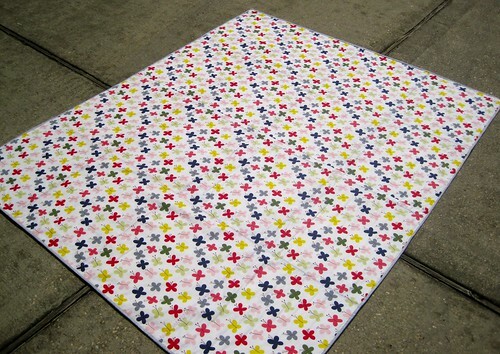 I just KNEW I had to include some of the Heather Ross Munki Munki shoes in this quilt! I opted to used a modified zig zag to quilt this one--mostly because I stink at straight line! Since the blocks were quilt as you go, it didn't take long to do some minimal quilting over the seam lines. I also machine stitched the binding down with invisible thread in the bobbin and light grey for the top--I sewed it to the back first then brought it around to the front. I just started using this method for binding and I love how quick it is and how neat the binding still looks. It's not as perfect as handsewing, but when I have a million projects on my plate, something has to give. Looks great and I love that AH backing. Your friend must be over the moon. This is stunning! What a thoughtful and meaningful gift. This looks super fab!!! 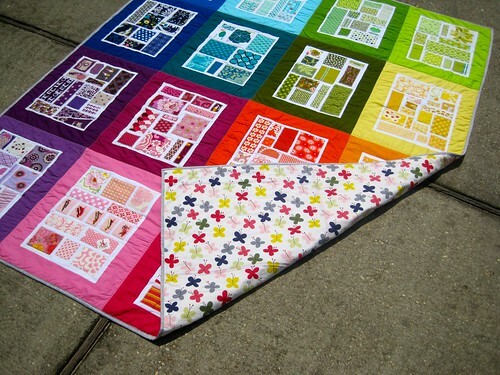 I had wondered about whether or not you finished off your Bottled Rainbows quilt :) I love the binding you chose, works perfect, and the zig-zag quilting looks wonderful too! It's beautiful! I think your binding choice was perfect, and I love that you personalized it for your friend. This is a stunner. You've done a great job. There is no reason to apologize for machine stitched binding. 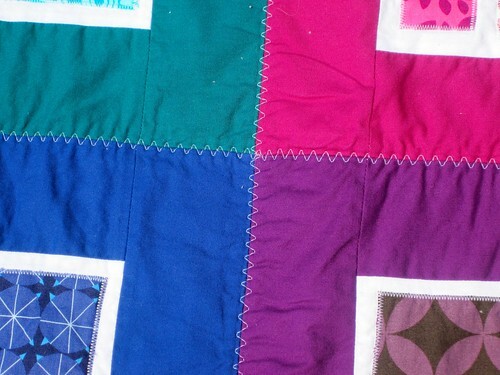 There are very few rules in quilting that have to be followed, and that's not one of them. If you do it right, the result is so pretty. Congrats, girl! I love it! Lucky friend. Even if she doesn't realize how precious this fabric is, I know she'll cherish the quilt because of the time and thought you put into it. 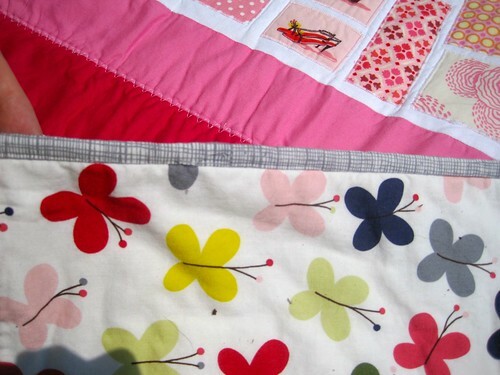 I have seen the quilt as you go method...however, do the seams end up bulky? Gorgeous! What a special present. Fabulous quilt! And such a nice story - you have a lucky friend! Invisible thread for binding - great idea! 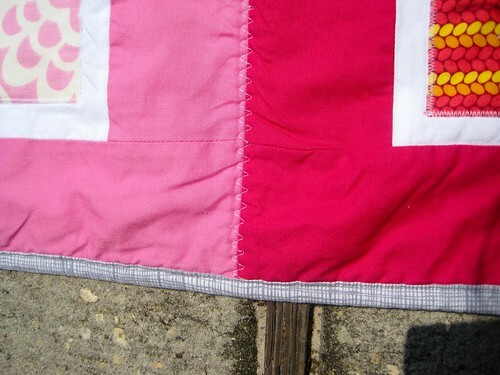 It's so fun to see your finish and that someone else used the zigzag quilting. The zigzags make me smile! 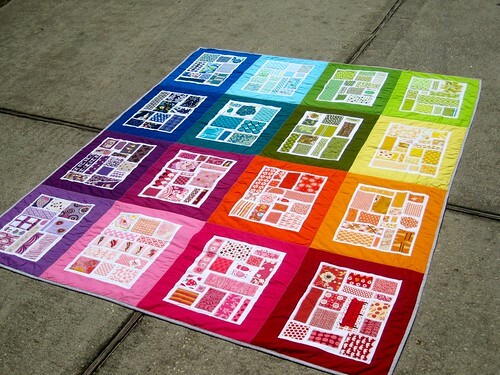 Your finished quilt looks amazing and I adore the fabric you chose for the back! I started mine towards the middle of Summer and just finished my 6th block tonight! It's a lot of fun and I can't wait until I am completely finished too!